If you followed the series so far we are pretty knowledgable in handling touches, displaying images and moving them around. But a moving image it’s a pretty dull sight as it looks really fake and amateurish. To give the characters some life we will need to do more than that. That is what animation is all about. A rock is an inanimate object and even if it is thrown, it doesn’t change its shape. A human on the other hand, is very animated. Try throwing one and you’ll see twitching limbs and even screams in the air. Let’s just resort to examining walking which is pretty complex in its own. Imagine a human crossing your way (just in 2D). You’ll notice different displays of the body. Left foot in front, right hand in front while the oposite limbs are behind. This slowly changes so the left foot remains behind while the right progresses along with the body. But at one point the cycle repeats. If you don’t close your eyes you see the person progressing smoothly. If you close your eyes and keep them closed for a bit and open them again the person already went on and is in a different position. Try blinking quite rapidly and you will see something like the old black and white comedies. That is low frame rate. More on FPS here. Actually we do want a low frame rate walking for this tutorial, just like this. 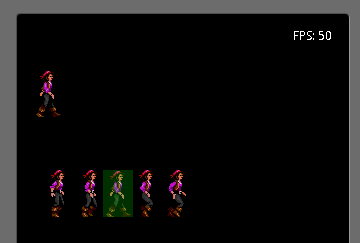 The walking presented above is a bit dodgy but it’s a ripped off version of the sprites from Monkey Island. She’s Elaine Marley. This is called a Sprite. It is a simple 2 dimensional image or animation. To be able to re-create the above animation, we need every frame from the walking cycle. It is a 150 pixels wide image and each frame is 30 pixels wide. To illustrate it better check the following image. To get the above animation in android (or iPhone or in any other program for that matter), we need to load up each frame as a separate image and display them at regular intervals one after each other. OR we can load up the big image containing all the frames and use the methods provided by android do slice and dice them on the fly and to display only the relevant frame. To do that is trivial. We know that we have 5 frames and each frame is 30 pixels wide. We define a rectangle (that will be our selection) which has the width of one frame and the height of the image. The following image shows how I cut out the first two frames. The rest you should fill in. Knowing all this let’s go create the project. We will use the knowledge from some previous chapters, most notably about the game loop and the one about the image display (here we set up the thread that triggers the drawing of the graphics item every frame). We will need an object to animate. We use Elaine from Monkey Island so I will the class ElaineAnimated.java. The private attributes are commented but worth mentioning a few. bitmap is the png file containing all the frames. The second image in this article. sourceRect is the selection rectangle. It is the blue window in the image above. The rectangle moves every frame onto the next. frameTicker this is the java timestamp of the last frame change in the walking sequence. Note that this is not the game FPS but the walking FPS. If we want Elaine to perform a complete walk cycle in a second we set the frame rate for walking to 5 because we have 5 frames. To get a really smooth animation we need 30 frames but it’s not the point now. framePeriod is time in milliseconds that represents the period of time a frame is being displayed. If the cycle completes in 1 second that means for 5 frames the period will be 0.2 seconds. That is, each frame will be displayed for 0.2 seconds. I’m assuming that the frames are the same width so I calculate the width of the rectangle by dividing the width of the image with the number of frames. I also pass in the fps which is again, the frames per second of the walk cycle not the game FPS. Elaine will have an update method of her own as she is an animated object and she needs to look good and she is in charge of dragging her feet. Because the period of the game update cycle and Elaine’s one might be (in this case is) different we pass the actual game time as a variable so we know when we need to display the next frame. For example the game runs very fast and the update is called every 20 milliseconds and we need to update the frame every 200ms, then the progression of the frame will happen at every 10th game update. The update is called from the main game panel (check previous entries how that works). This is the update method of the MainGamePanel class. The update method is simple (Elaine’s). It increments the frame if the passed in time (which is the system time when the update method was called) is greater than the last time (frameTicker) the frame was updated plus the period of the next update. If the next frame is beyond the last, we reset the cycle. After all that area from which the image will be cut out is defined as the sourceRect. That’s it. Now let’s go on to display it. That is all. We set the destination rectangle as to where to draw the cut out image. It is at Elaine’s position (X and Y set in the constructor). tells android to cut out the image defined by sourceRect from the image contained in bitmap and draw it into the rectangle on the canvas defined by destRect. The MainGamePanel.java differs slightly from the one from previous chapters. I got rid of all the droidz and added just Elaine. Elaine is instantiated in the panel’s constructor and is given an initial positon of (X=10, Y=50). I pass in the width and the height of the sprite too but that is ignored anyway, but you can modify the code. The FPS is very important and the number of frames too. FPS says how many frames are to be shown in one second. The last parameter is the number of frames in the cycle. The thread and activity classes haven’t changed at all. You can find them in the download as they are quite long to be pasted. The image is named walk_elaine.png and it was copied to /res/drawable-mdpi/ so android can pick it up automatically. If you run the application you should be seeing Elaine performing walking cycles in one place. We should have used jumping as that can be performed in one place but you get the idea. To make some neat additions modify Elaine’s draw method so it displays the original image containing the sprites from which the frames are extracted. This just displays the image at (20, 150) and creates a new paint object so we can paint over the current frame on the original image. The method setARGB creates a semi-transparent green paint. The first value is 50 which means it’s 75% transparent. 0 is completely transparent while 255 is fully opaque. After everything was drawn we paint a rectangle of the size of a frame onto the original image so you see which frame is being displayed in the motion. That’s it. Run it and you have your first sprite animation.